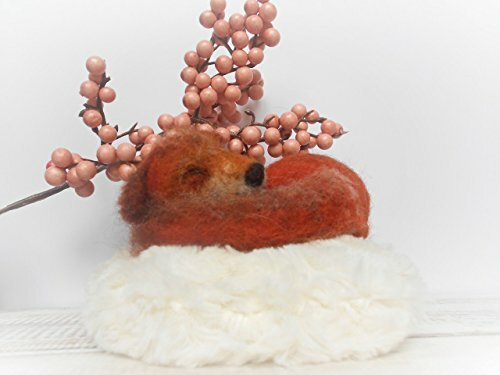 Woodland nursery decor, Woodland animals, Sleeping fox, Needle felted fox, Handmade animal, Gift animal lovers, Kids room decor, Hunter gift, Melkada This gorgeous lsleeping fox is handmade from fine quality wool with needle felting. It measures about 4 inches. This felted fox has its own personality and unique charm and is sure to spread some Enchanted Magic in any room. It is a great addition to woodland themed rooms. A great gift for an animal lover or a hunter! This wool sculpted forest animal is perfect for collectors and can be placed on a bookshelf, nature table, mantle and many other places to add a touch of coziness to the home. I take great care and invest many hours in creating the features of this sleeping fox. It is one of my favorite woodland animals to create! It is a realistic, completely handmade, 100% Eco-friendly, natural product. Please note that item ships from Hungary and it takes about two weeks to get there! If you have any questions about this product by Handmade by Micuka & Melkada, contact us by completing and submitting the form below. If you are looking for a specif part number, please include it with your message.